As always, this kind of report makes me curious about how the Austin/Central Texas real estate market compares. That’s the reason for this post. A key influence on home values during this difficult period has been the proportion of distressed sales (short sales and foreclosures) in a local market area. Looking at the lists above, you will see that most of those metropolitan areas are still seeing huge numbers of foreclosed homes (REO Saturation) — 30% to 50% of all home sales! In contrast, 13.7% of homes sold in the Austin metropolitan area in May through July were foreclosures, and they tended to be concentrated in identifiable subdivisions and hyperlocal market areas. Distressed sales have not exerted the kind of generalized price pressure here that many other cities have experienced. Summary: According to Clear Capital the healthiest quarterly gains in home values were in the Midwest 7.3%) and the Northeast (4.9%). Texas is in the South in their study, where quarterly improvement was 3.5%. The Austin area is above that average — using data only through July. Based on “raw” MLS data, expect to see final August prices higher than July, so our “apples to apples” comparison with these other cities should look even better. 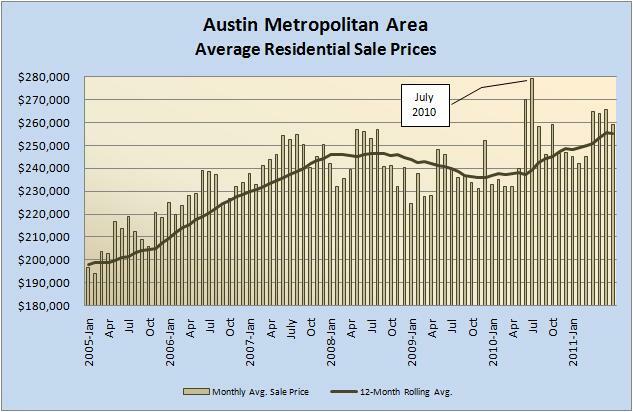 Moreover, Austin’s slow-but-steady growth is very refreshing given the upheaval still going on in so many other places.